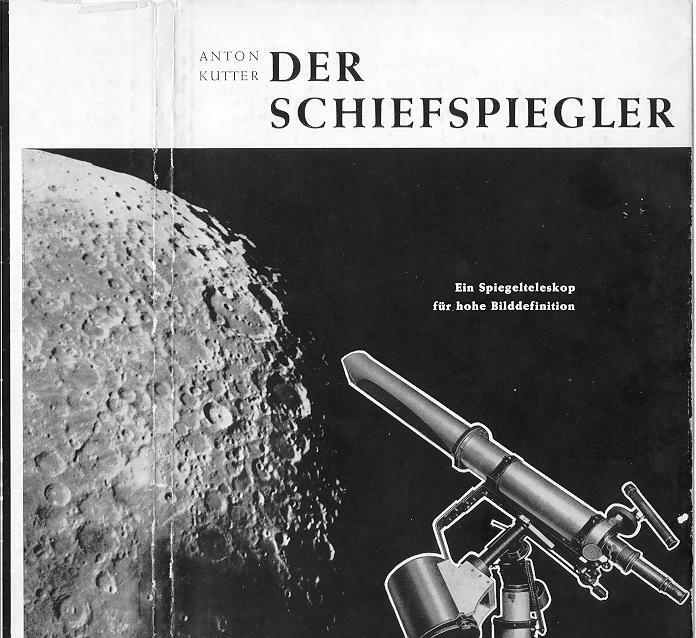 Anton Kutter's book, "Der Schiefspiegler"
The cover of Anton Kutter's pioneering book, Der Schiefspiegler. 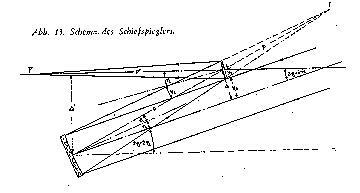 The subtitle is "Ein Spiegelteleskop für hohe Bilddefinition", which means "A reflecting telescope with high image definition"; this describes well the philosophy underlying the Schiefspiegler construction. The optical outline of the Kutter Schiefspiegler construction. The light from the observed object comes from the upper right, falls onto the prime mirror depicted in the lower left, is obliquely reflected and focussed to the secondary which is right of the upper middle of our sketch, and finally reflected (again by an oblique angle) to the system focus on the left hand side of our graphic. As in any telescope, the image in the focus may be observed with eyepiece, film, spectroscope, CCD camera, or whatever you like.